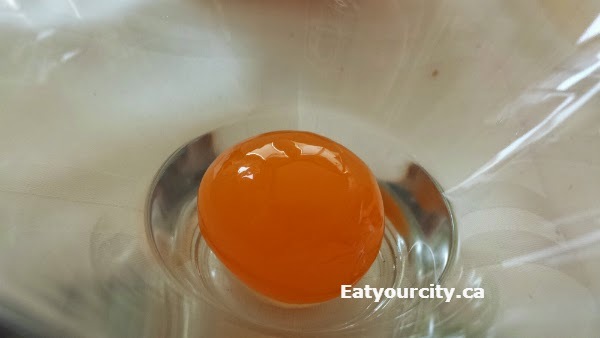 Eat Your City: Homemade Organic Salted Duck Eggs Recipe - how to make salted duck egg yolks! 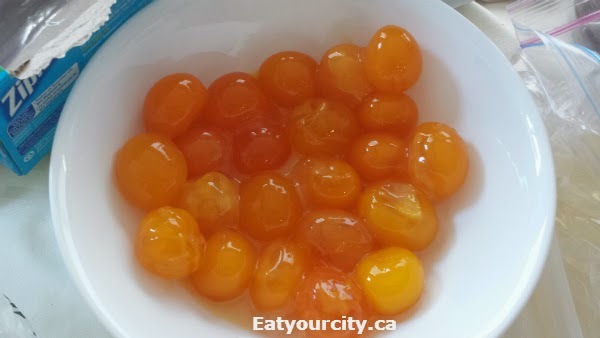 Homemade Organic Salted Duck Eggs Recipe - how to make salted duck egg yolks! Its caviar? nope... its candy? nope! ... its Salted duck eggs! Sounds like a simple preservation method to save some eggs for a rainy day. But in reality, these seemingly simple golden salty orbs lend complex rich flavors and practically ooze salty savory unami and indulgence to many Chinese dishes that elevate a simple salted duck egg yolk to culinary gold. It can be added as a sauce to fish, shrimp or fried crab (so good! ), tucked inside sticky rice banana leaf packages, plunked atop various steamed dim sum dishes and incorporated into various salty/sweet dumplings, and pastries like the moon cake. It requires a few quality ingredients - try to get your hands on the freshest duck eggs you can get your hands on and a bit of patience. 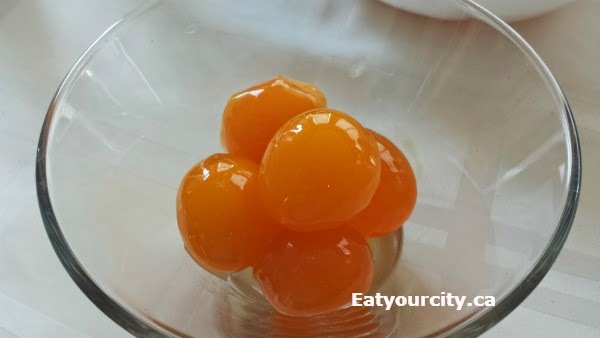 And what of the resulting orange-y red hued rich salted egg yolks I brined? 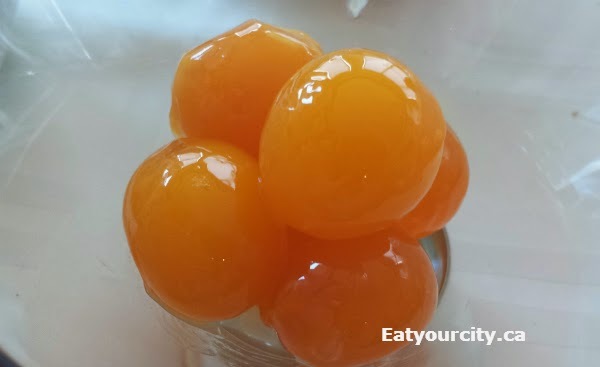 As I had made multiple jars to test and tweak recipes, I had a lot of excellent salted duck egg yolks! Many were given away and I had lots of requests for the recipes from many of my Chinese friends' moms lol... I'd say that's a sign of success! I was lucky to source some wicked huge fresh organic free range duck eggs from Moose Wood Acres Farms from a super friendly and awesome Kristy! And yes, if you were wondering, the salted duck egg yolks get that beautiful color without food coloring and I didn't touch up the photos at all! First off, try to get your hands on the freshest duck eggs you can get... hit up farmer's markets, ask around in your area, as there's bound to be an awesome farmer out there close to you that can provide you with freshly laid duck eggs, rather than the dubious ones that languish in Asian grocery stores for months on end (Which is weird as duck eggs should be consumed within 6 weeks max -they stay fresher due to their thicker shells than chicken eggs). If you shop local, you support local farmers and you'll get the best rich salted duck yolks you'll ever see! I used huge organic duck eggs from Moose Wood Acres Farms! 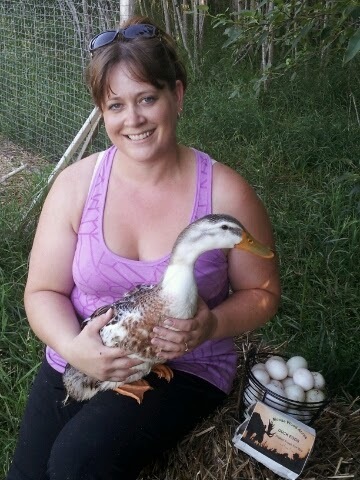 (Available spring to late fall) Here's a pic of Kristy with one of her awesome duckies! I totally forgot to take a picture of the eggs brining happily in massive and little pickling jars.. I had several jars going so I could see if +/- certain flavorings made a difference and I pulled out eggs to test over time to see what would be optimum brining time... Here's a pic of my biggest jar full of eggs ready to get covered in brine! Duck eggs are lower in water and higher in protein content, so they make fluffier cakes/pastries (have yet to try this out to test it for myself), stiffer scrambled eggs, richer icecream/ custards... and decadent quiches. Duck eggs, just because they are larger than chicken eggs are higher in cholesterol than chicken eggs, but most folks can safely indulge in salted duck yolk recipes every now and then... eggs are good for you! And here are some are after about 50 days in the flavored brine, after I plucked them out fromt eh jar of brine, gave it a quick rinse and wiped dry. The brine added just a shade of ruddiness to the egg shells. I was originally planning to brine some batches for 30, and some for 40 days, but got busy so had a batch that was close to 50days... so you're probably wondering why I pulled out eggs at different times? Well, I was doing this for the first time, and brining times varied online between 30-40days... and I wanted to know which would provide me with the best colored, textured and tasty culinary golden egg! 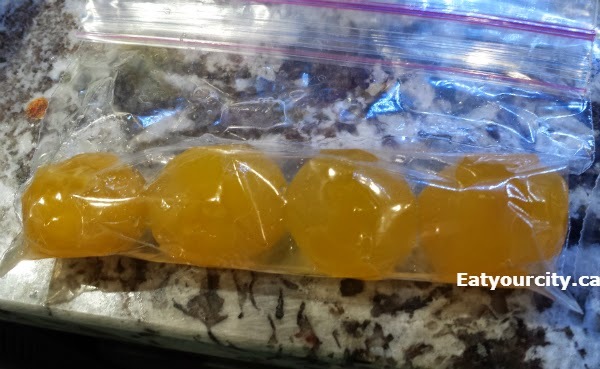 I forgot to write down the exact "dates" of each of the yolks pictured below, but I thought it would be cool to showcase a visual of what happens to a duck yolk as it brines over time (least amount of brining to most from left to right). The yolk takes on a gel-like texture, then gets firmer over time - yolks were all about the same size.. they just appear to get bigger as the yolk firms up over time and doesn't flatten into the counter). The colour changes from sunshine yellow and takes on orangey red hues. The right most one had about 3 weeks brine time. -When boiling your brine solution, DO cover your pot with a lid - ANY tiny aggravating crystal speck of salt will cause a whole bunch of salt crystals come out of solution and form making a foggy (and ineffective) brine.. if this happens, just crank up the heat and reboil! -DO NOT remove lid until the brine solution is cool or you may introduce in salt crystals and you'll have to reboil... again! -DO wait for the brine solution to cool before adding in raw eggs, you don't want to cook your eggs before you brine them! 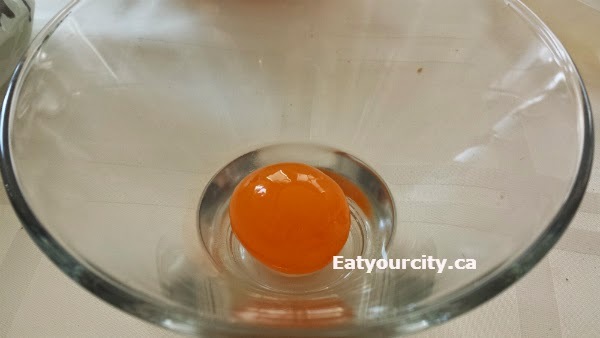 -DO use duck eggs and not chicken eggs, duck eggs are larger and a bit more expensive, but you won't get a great oily salted yolk unless you use duck eggs. 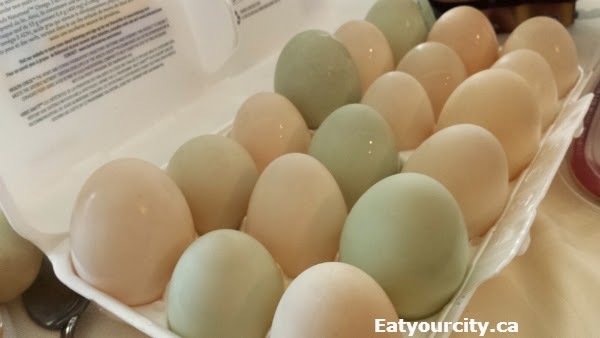 That said, if you really can't source any duck eggs in your area (or its winter when ducks won't lay eggs), this recipe works for chicken eggs too, but expect a slightly dryer and smaller yolk. 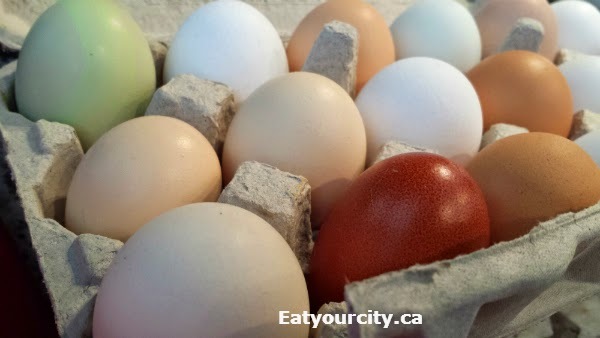 That said, Moose Wood Acres Farms also sells some fab organic rainbow coloured chicken eggs from their free range chickens! 1) Wash and dry your eggs well - get any traces of poop off!! (mine were nice and clean but I still gave them a quick rinse). Examine for any cracks. Always only use whole uncracked fresh eggs. Pop the clean and dry eggs back in the fridge in a clean bowl until your brine is made, cool and ready to go. 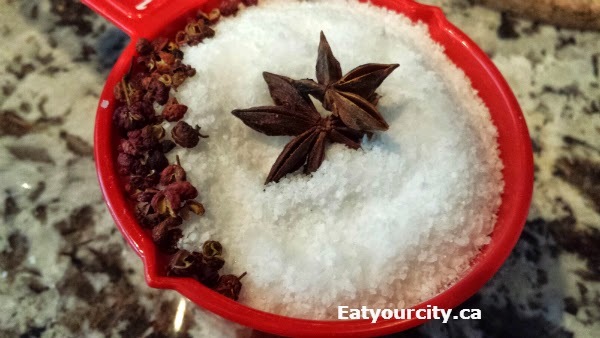 2) In a med-large pot that can easily hold 4 cups of water, bring to a boil water, salt, peppercorns and star anise. Cover and let it boil for at least 5 minutes or until you no longer see salt crystals. Let pot of brine cool for a few hours with the lid on. 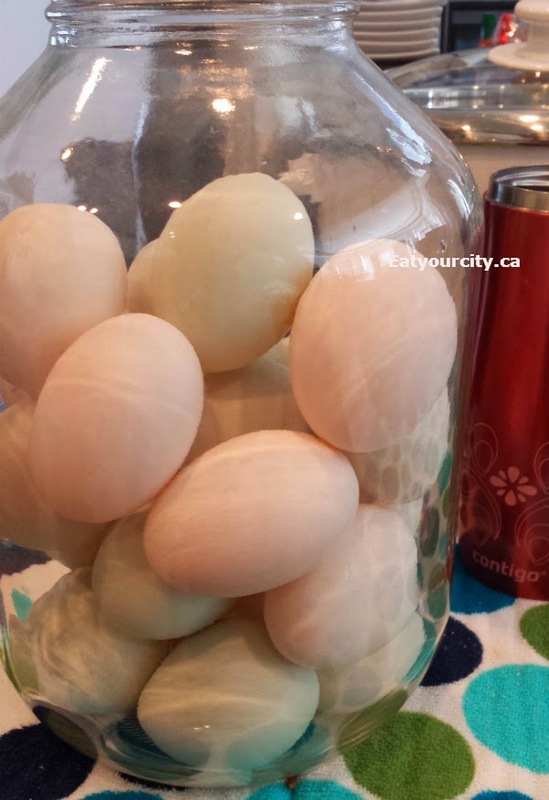 4) Mix in the Shiaoxing wine into the completely cool brine, then pour the brine (with flavoring ingredients) into the jar, completely covering the eggs, and ideally completely filling the jar. Place a small ceramic cup (or a glass - avoid metal items as they may add a metal taste to eggs) to weigh down the eggs so they remain completely submerged in the brine if necessary. Wipe up any spills and splashes. 6) After the brining period, take out brined eggs, rinse, pat dry and store in fridge (uncracked) for up to a month. Alternatively, crack them into ziplock bags, squeeze all the air out and freeze up to a year.